Along Came Poppy: The Elf on the Bookshelf returns! 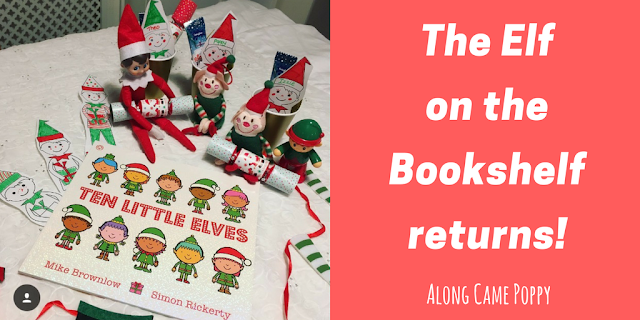 I am pleased to confirm that the Elf on the Bookshelf has now arrived in Yorkshire and he has brought some chilly North Pole-esque weather with him - it's currently snowing! 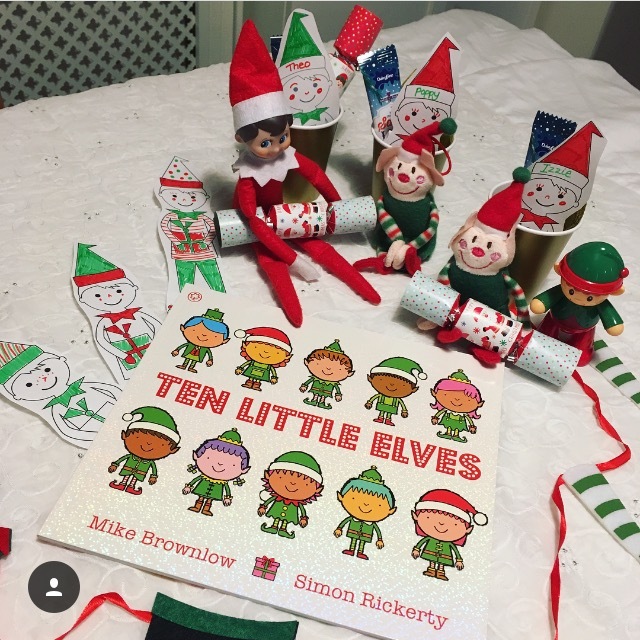 Elvis appears to have enlisted the help of nine new friends to pick out his first festive book, Ten Little Elves. I purchased this book because Mini Reviewer, Theo (3), adores this series by Mike Brownlow and Simon Rickerty. Ten Little Supeheroes, which we have previously reviewed remains a firm favourite. You can read our review here. In this festive rhyming story Santa's reindeer are poorly and need some cough drops, the elves set off to get some but are gradually picked off until there is only one left. Will the one remaining elf be able to get the reindeer's medicine in time to save Christmas? Well you'll have to read it for yourself to find out! It is a great book to help counting down from 10 as it follows the same format as the other books in the series. The rhythmic, rhyming text make it easy for little ones to join in with and the bold illustrations are bright and colourful and absolutely perfect for this time of year. You can follow us on Instagram to see our daily book choices and you catch up with all of last year's books here. We do hope you enjoy Elvis' festive picks he does have impeccable taste in books - wink, wink!